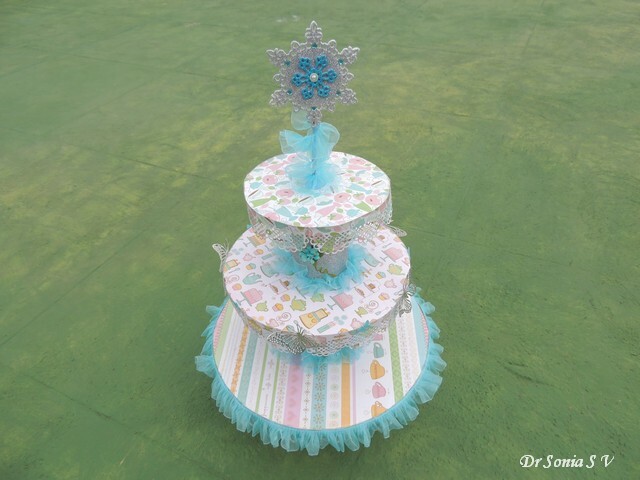 Hi friends sharing a 3 tier cupcake stand I made for my daughter's Frozen themed Party [you can read about some of our other Frozen theme party decor here : DIY Frozen BirthdayParty]. 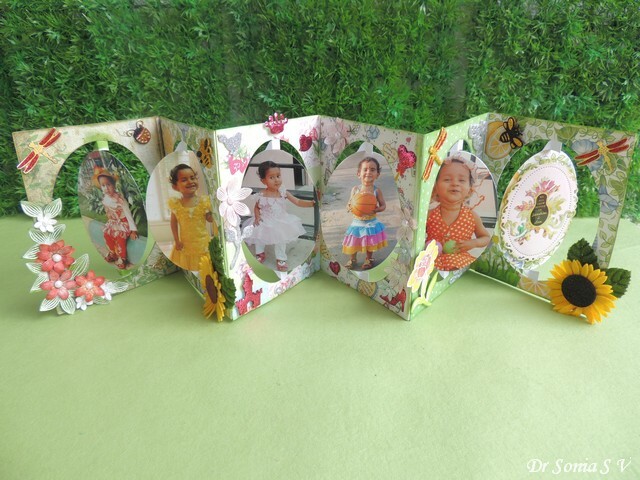 Store bought stands are very expensive and I dare say not so pretty or personalized! 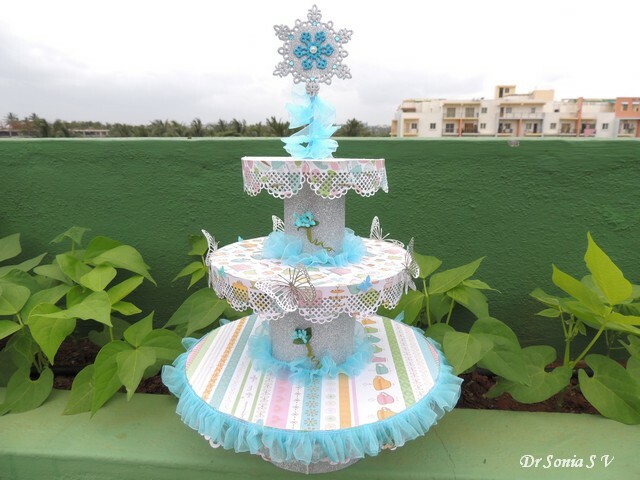 You can make these stands in 2,3 or more tiers to display not only cupcakes but all kinds of party food or even to beautifully display your handmade crafts for your next craft exhibition or to simply sit prettily in your room to display little knick-knacks! 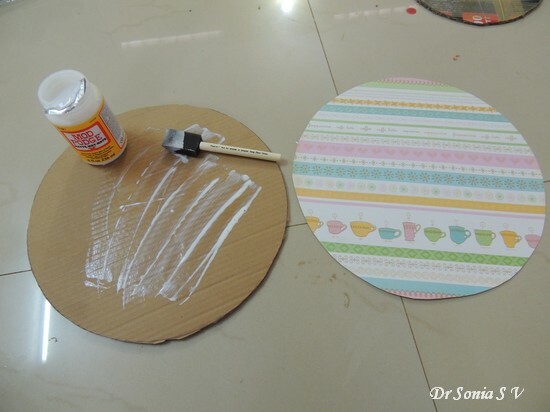 Apply normal white glue or preferably a decoupage glue such as mod-podge [ you can read about Modpodge here : Mod Podge Tips and Secrets] on the non-glossy surface of your cardboard / wooden shapes and stick pretty paper. 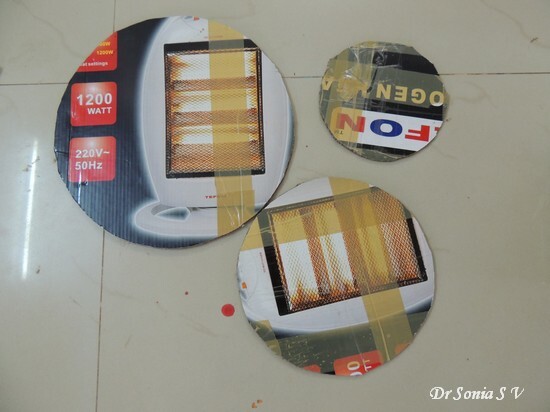 If you use a foam brush you can quickly and easily apply a uniform thin coating of glue [which is essential to prevent wrinkling and wrapping up of your lining paper]. 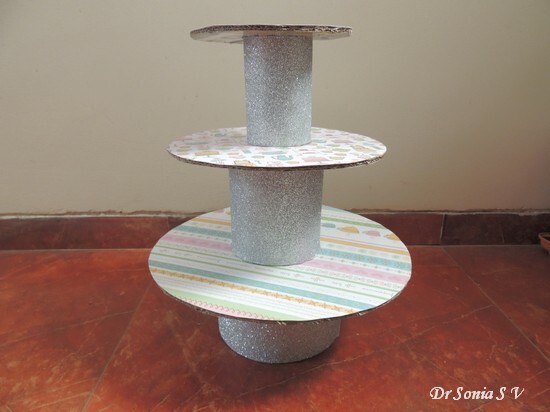 For pillars of your stand you can recycle tins / card board tubes or even plastic containers like I did here. 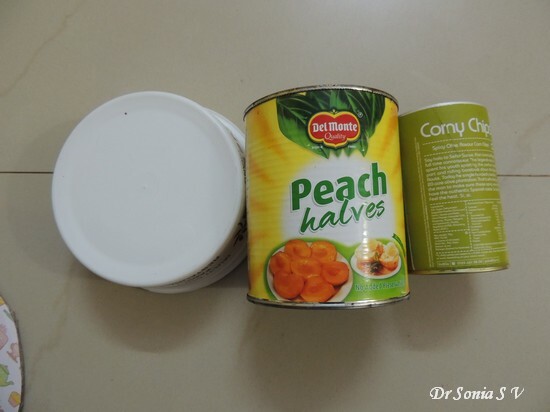 Tins cans are quite sturdy as pillars but I couldnt find one which fitted the height requirement I wanted for my base [yes we creative souls are sometimes finicky to the centimeter!] 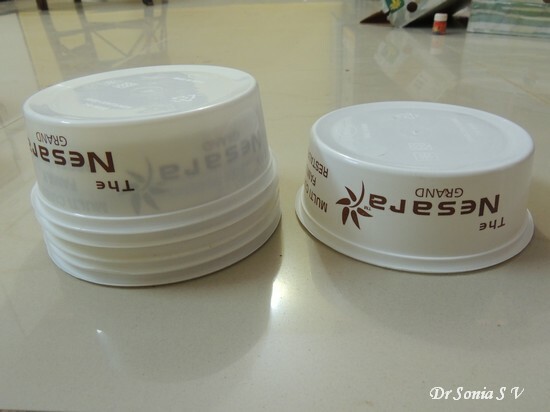 so I stacked several plastic containers to get the height I wanted and still keep the base sturdy! 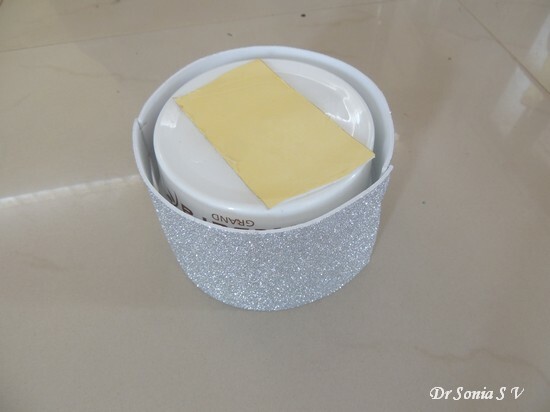 Wrapped and hot glued silver glitter foam around the stacked containers and the yellow rectangle you see on top is double sided foam tape I added to help level the top and easily stick it to my cardboard piece. 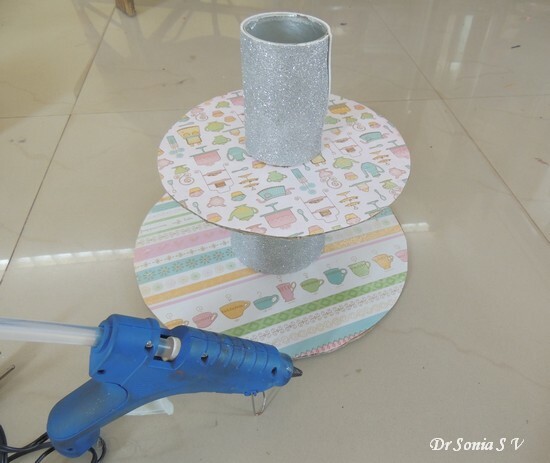 Not only do I love the look of glitter foam , the reason I used foam in this project was that if you hot glue foam you will get a very strong adhesion! 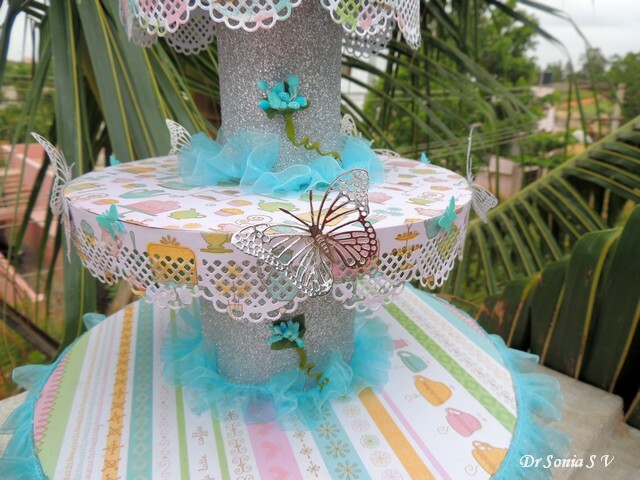 Here is how my 3 tier stand looks un-embellished. 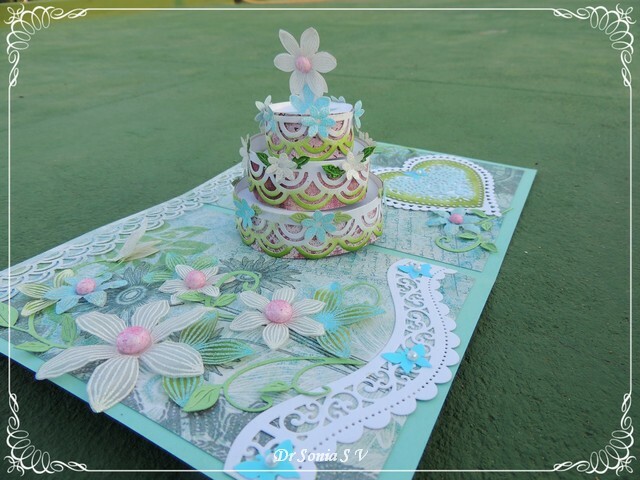 Covered the raw edges with a Joy Crafts die cuts and added lots of silver Cheery Lynn die cut butterflies interspersed with tiny blue plastic butterflies. 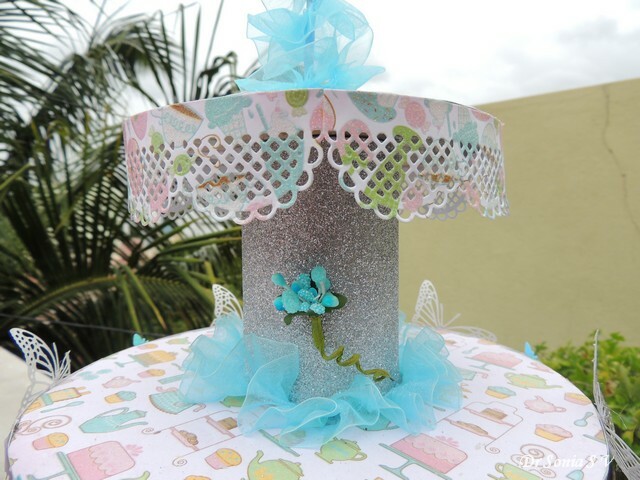 I used blue ruffled ribbon on the pillar base[ also serves to hide glue blobs!] and also added tiny pollen bunches on the pillars to deck them up a bit! Since this particular stand was for our Frozen theme party I added a glittery snowflake on top. 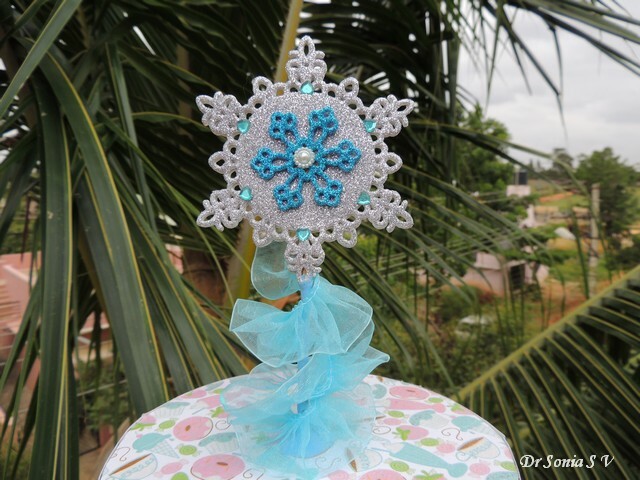 The snowflake was attached to a wooden skewer attached to the top tier of the stand using air dry clay. 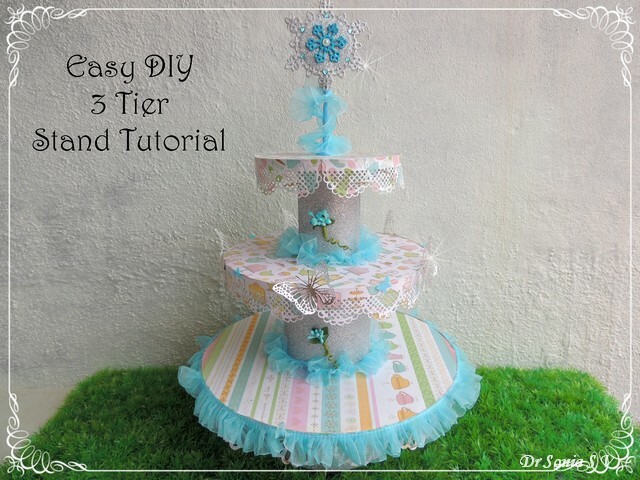 Edited : This tutorial was featured at Totally Tutorials! 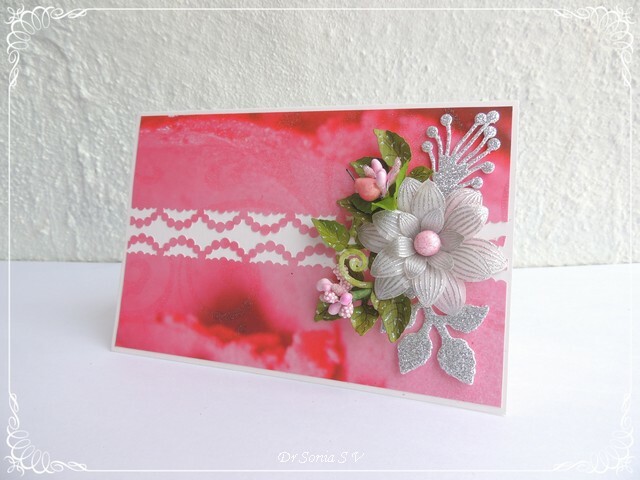 Hi friends sharing yet another simple card I made to showcase the gorgeous Martha Stewart beaded ruffle border punch from Crafters Corner. 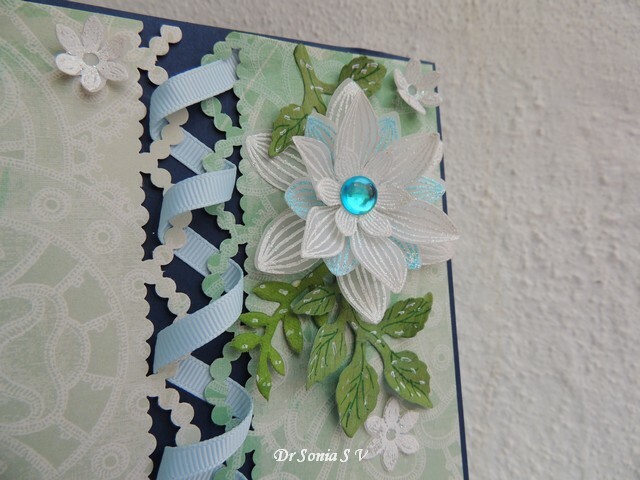 The huge handmade flower was made by stamping and heat embossing on Parchment and is very similar to the one I shared in the Leaf tutorial except that I made the petals concave instead of convex and embossed using white and blue embossing powder. 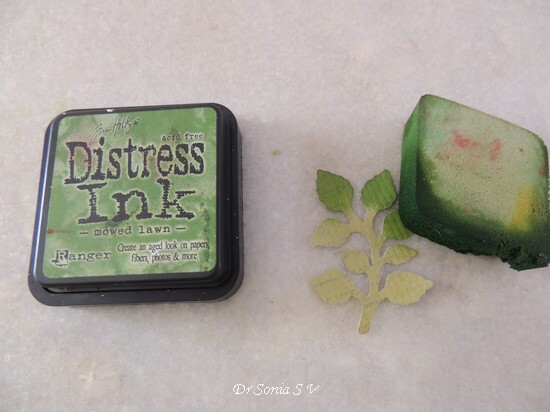 The best thing about crafting as a hobby is there are so many new techniques and products to experiment with and the resin fairy you see is the result of my first experiment with resin! 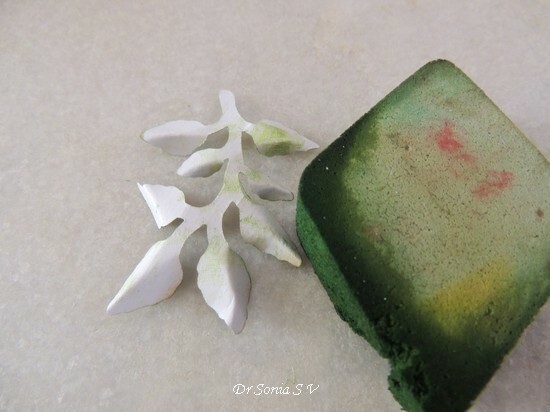 It was so thrilling to mix up 2 liquids, pour it into a mold and un-mold to reveal a solid translucent object .My resin fairy's features are not very well defined in this picture but it looks so lovely to see the light shine on it! 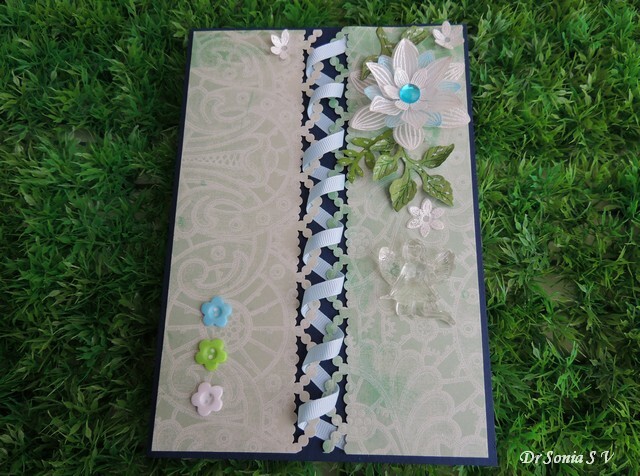 Ribbon weaving to make this card was super simple- I popped up 2 panels with punched borders on double sided foam tape and wove a ribbon through the punched area. 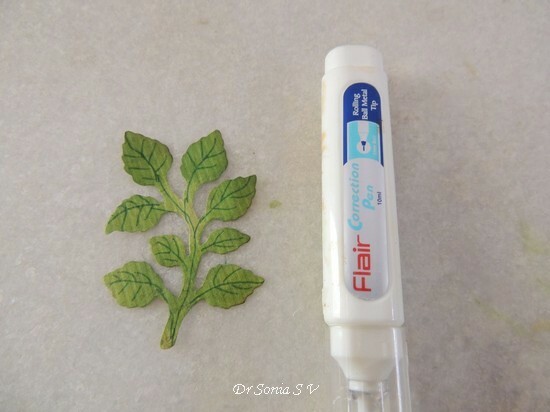 Parchment Flowers + Easy Leaf tutorial ! 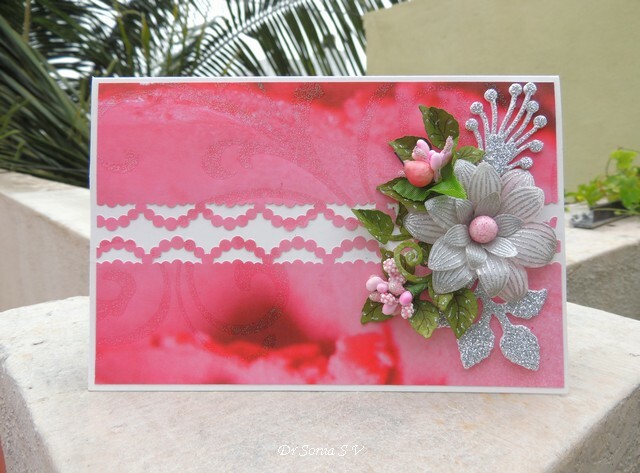 Dear friends sharing a simple card with silvery embossed parchment flowers. 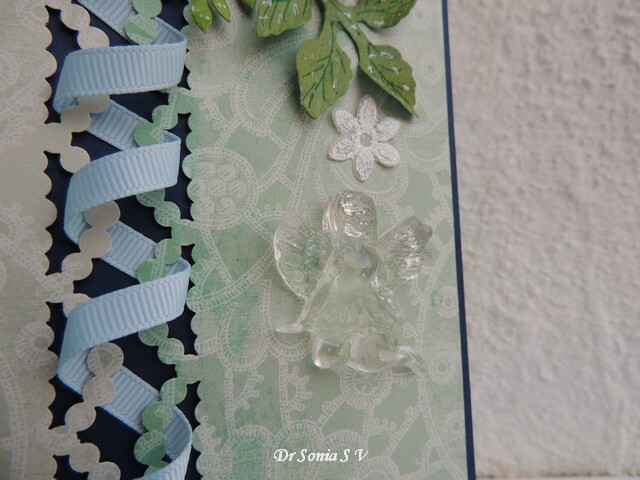 Cut a beautiful glitter textured DCWV pattern paper into 2 panels and used a Martha Stewart beaded ruffle border punch on the adjoining areas and layered it atop ivory card stock. 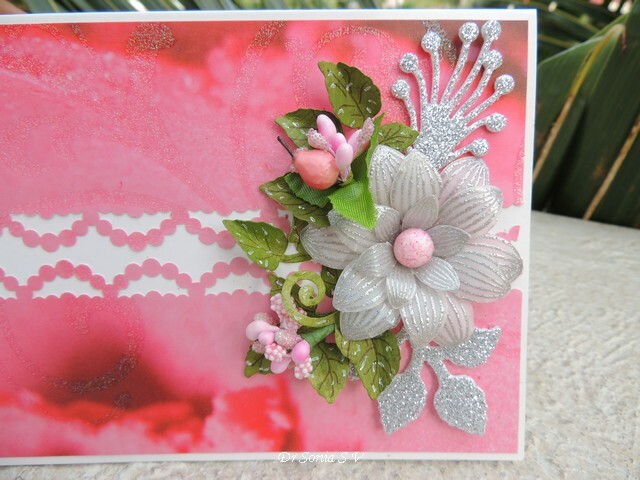 The flowers were made by stamping and heat embossing with silver embossing powder on Parchment paper and later die cut with my favorite Heartfelt creations Sun kissed fleur die.The cute mottled pink center of my handmade flower is a thermocol ball! The tiny pear on my floral bouquet is a find from the local market..doesnt it look yummy?! 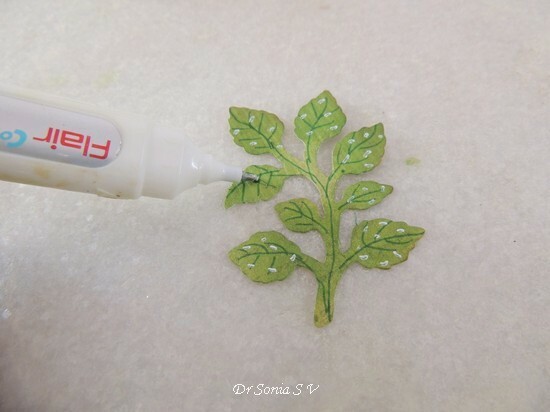 white gel pen / correction pen. 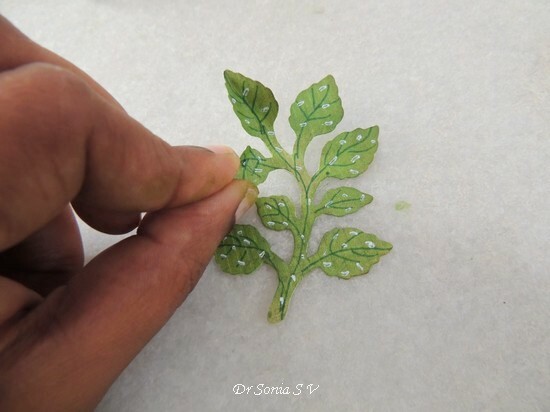 Draw veins randomly on your leaves- dont stress out about being perfect- remember nature abounds in imperfections! 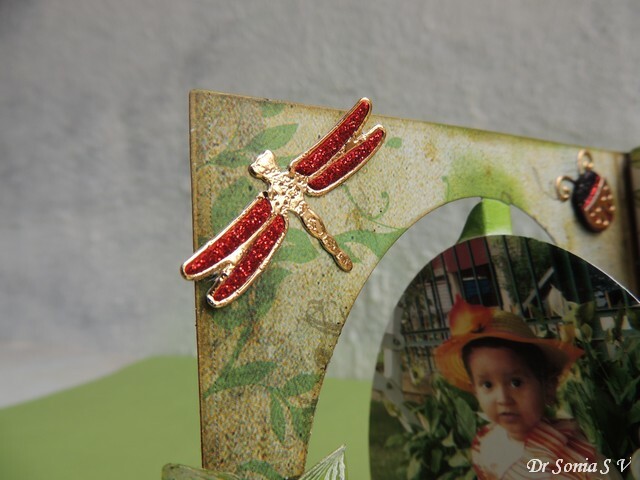 Looks good now itself but if you want to have more fun add a speckling of white dots using your favorite white ink. I didnt have any good white gel pen so used a correction pen! 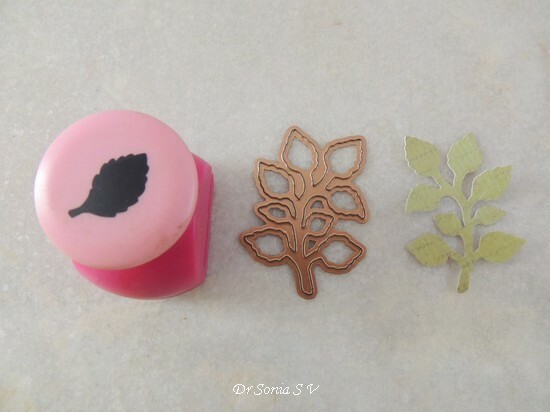 Either emboss your leaves using embossing tools and a mousepad/ embossing pad or for a quicker option simply pinch the leaves using your fingers! 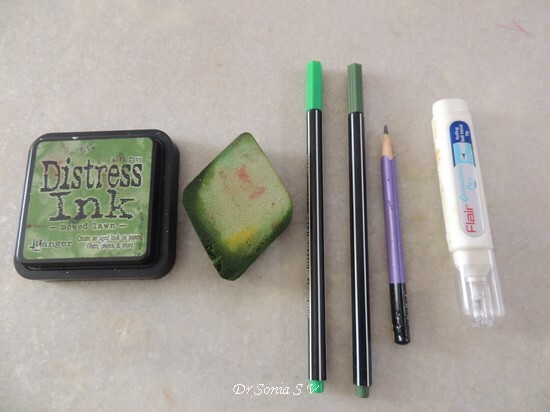 Oh and if your paper is white underneath dont forget to ink it too! 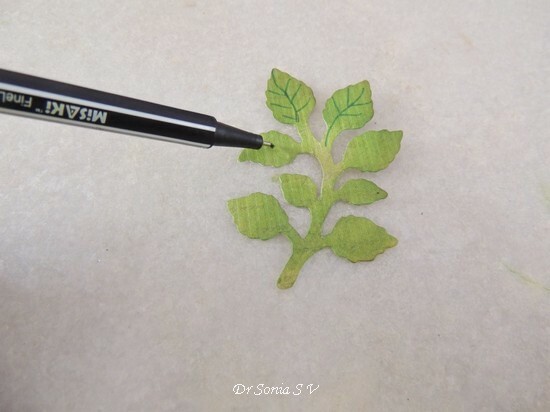 I confess I am obsessed with leaves...I cant resist buying leaf punches and dies and also keep on experimenting with ways to get different leaves with my existing supplies too! I hope you liked my simple card! 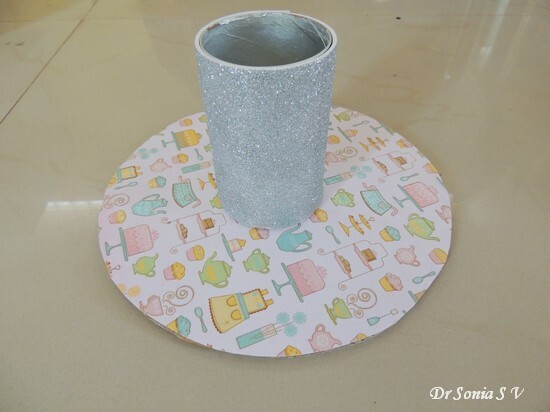 The pop up cake can be made without using dies and if you google up you will find a couple of tutorials but needless to say I found it much easier to make with Karen's die[ a Sizzix one]. 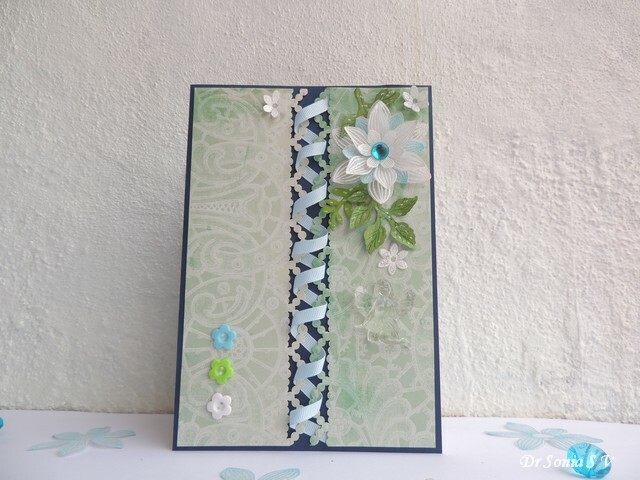 I am still not completely over the "blue and white " phase courtesy all the crafts we did for my daughter's Frozen theme birthday celebration and hence all the white and blue inked parchment and vellum flowers. 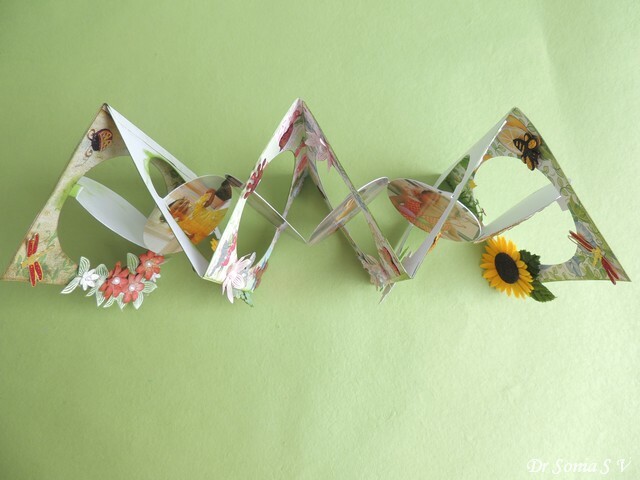 Since I dont have any tutorial sharing a few crafty tips! 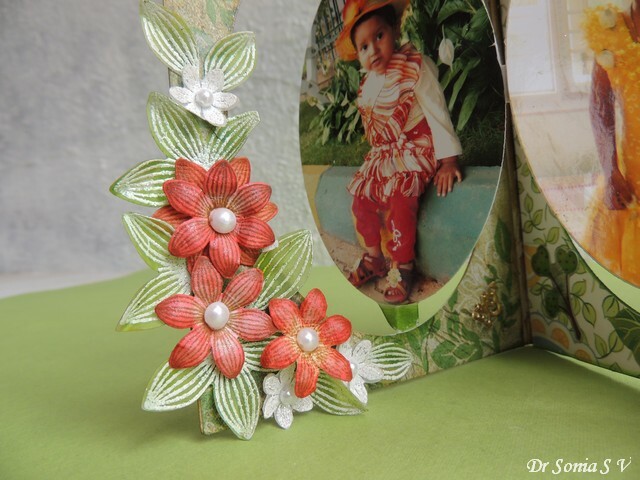 Tip 1 : You need not always match the colors of your floral embellishments to your background .Here the stripes on my stamped and heat embossed flowers [Heartfelt creations sun kissed fleur stamp -die set] match the striped flowers in the background pattern paper [ DCWV]. 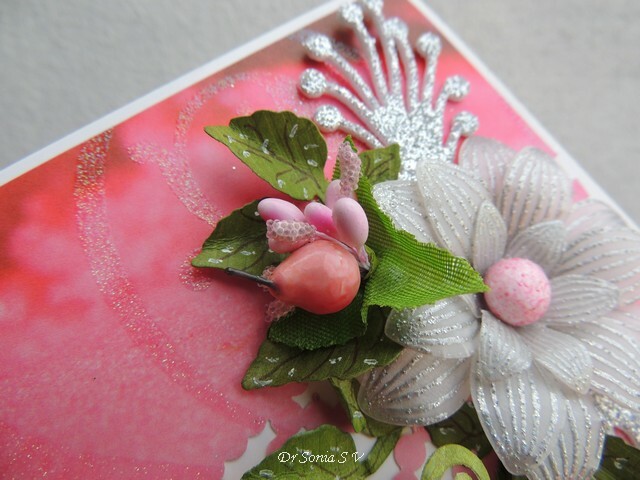 Those little pink centers on my flowers are not fancy beads but thermocol balls! 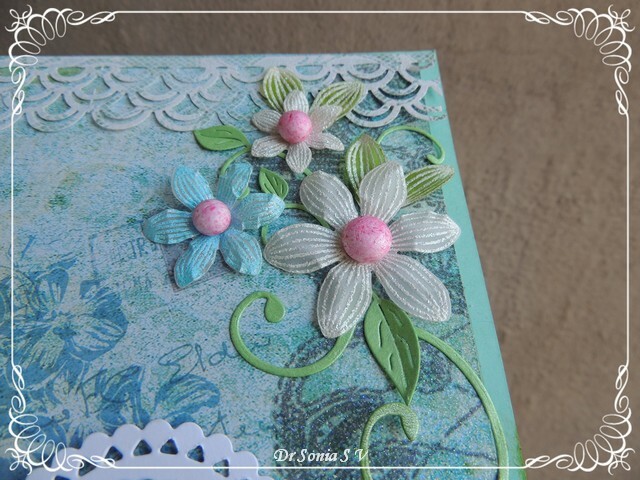 Tip 2: I found flowers stamped and heat embossed on the thinner vellum more pliable [ the blue one you see above is a vellum flower] while the white parchment flowers retained the convex shape I embossed on the petals despite being squashed flat on closing the pop up card! 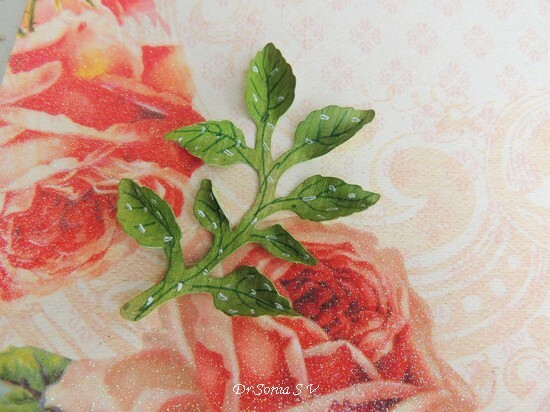 So if you want your handmade flowers to retain their shape opt for parchment paper instead of vellum . 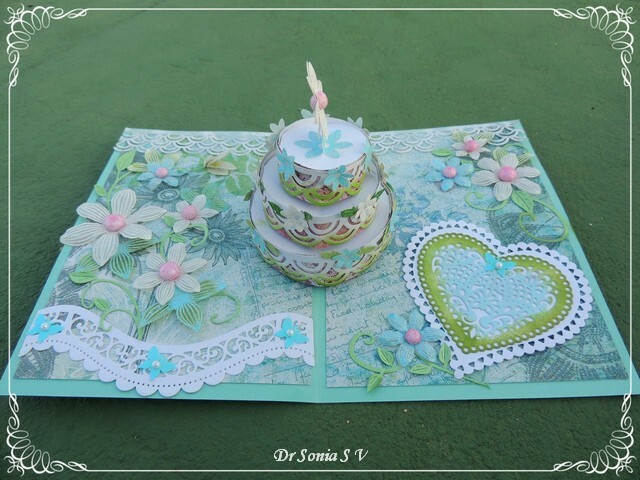 I hope you liked my Pop Up Cake card. 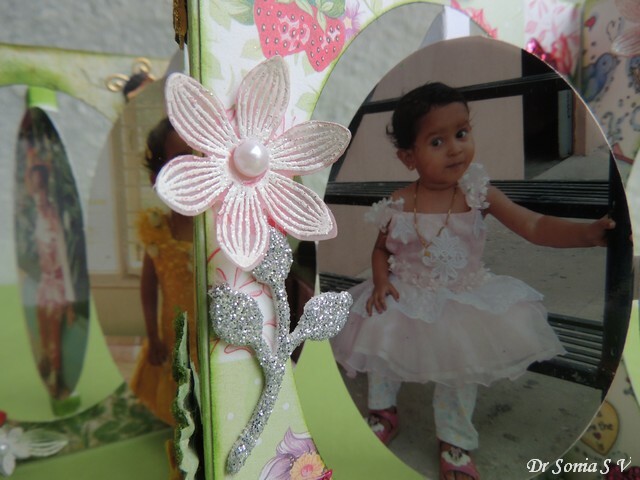 Dear friends Thank you so much for all the love and wishes you showered on my daughter's Frozen theme birthday post ! 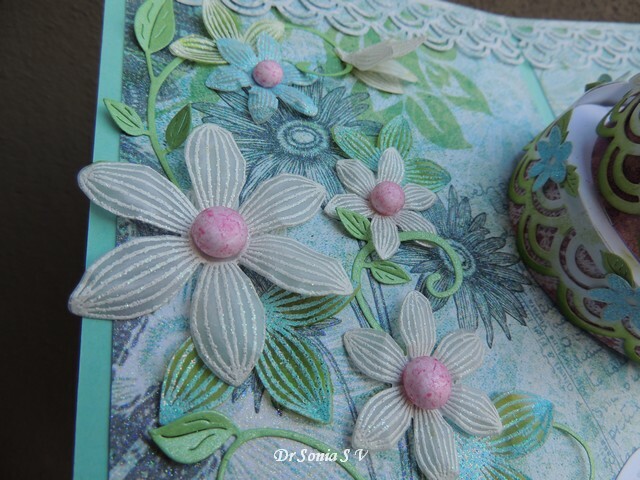 The Heartfelt creations sun kissed fluers were inked with distress ink and a few strokes of wink of stella.The white flowers were stamped & heat embossed on parchment and the leaves were stamped and embossed on parchment and inked with mowed lawn distress ink. 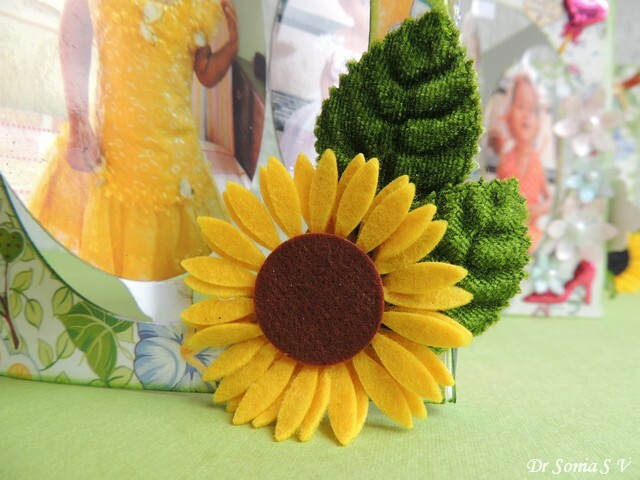 Used fabric leaves for felt sunflowers made using Cheery Lynn die again. 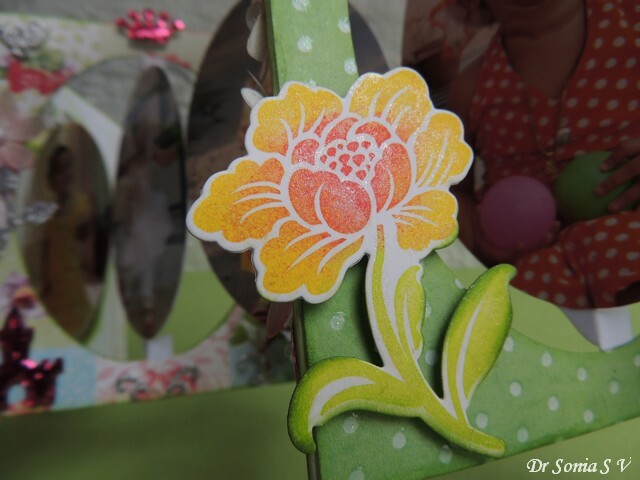 Added Wink of Stella for a subtle shimmer on this Hero Arts stamped flower. 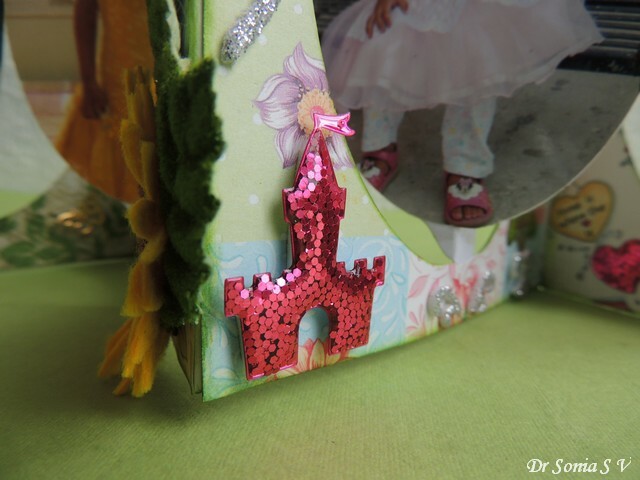 The cute castle is a sticker I had been hoarding for ages! 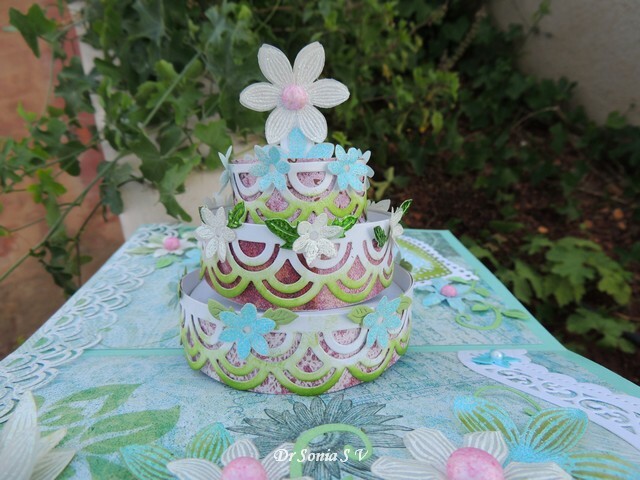 Made a this parchment flower [stamped and heat embossed] and tinged it pink to match the lacy pink frock my daughter is wearing in the photo! 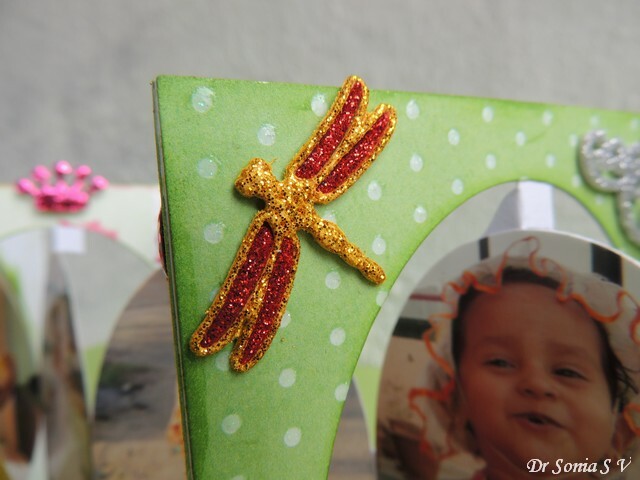 The Cheery Lynn dragon fly has become and favorite and I love how glamorous it looks in glitter foam! 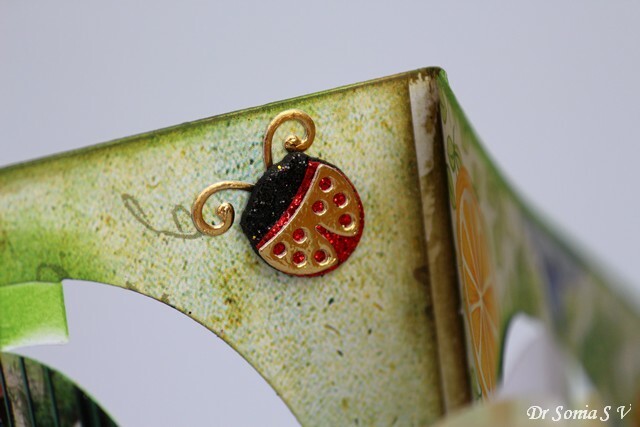 The Cheery Lynn die cut ladybird has multiple layers of glitter foam and metallic gold paper! 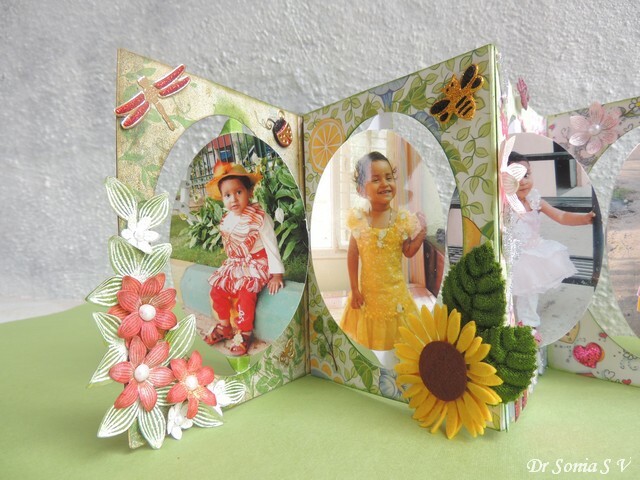 This is my first mini album of sorts and kept it simple by just mixing and matching the pattern papers and embellishments to match the colors in the photos! 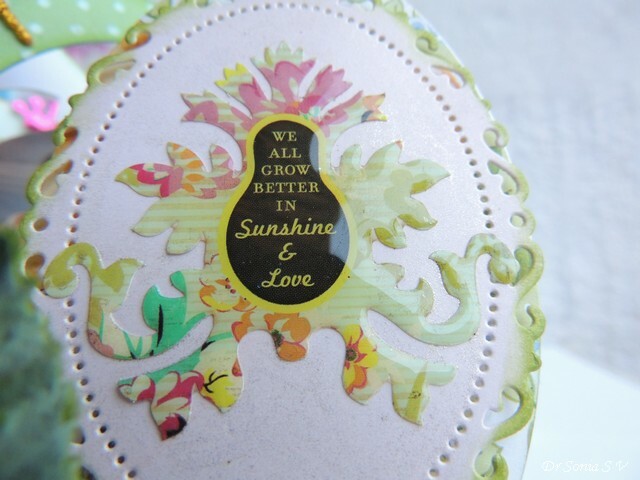 This beautiful epoxy sticker was gifted by my friend Lisa! Thank you so much for your generosity Lisa! 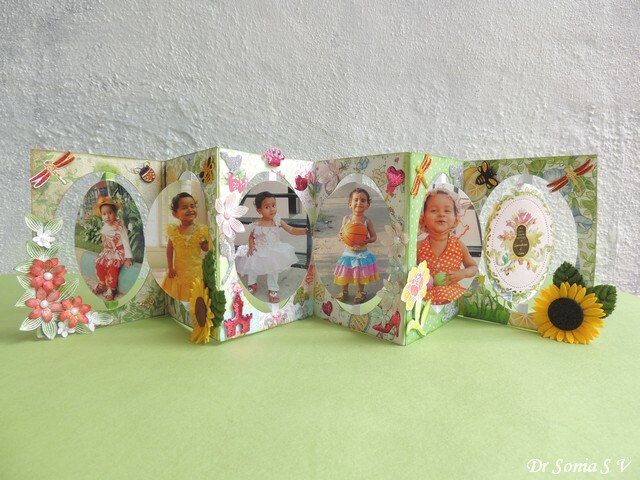 This view shows the accordion folding and pop up elements in the pop up album and the best thing is it can be folded flat and stored away! 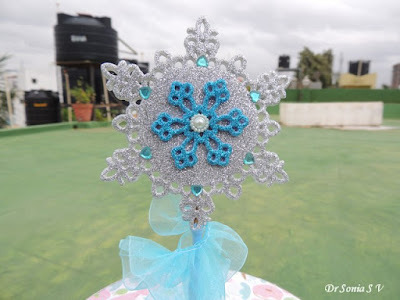 A DIY Frozen Themed Birthday Party ! The Generosity of the Craft Community !